Since the unrestricted use of LHV vehicles is finally allowed from November 2011, Van der Haas ordered it’s first LHV vehicles. 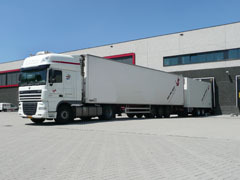 The LHVs will consist of a truck and trailer with an extra close-coupled trailer added. This combination will have the capacity of 66 Danish trollies. Draco Sneek will build the chassis, while EBO van Weel takes care of further construction. Cooling will be provided by a collaboration of RH koeling and Govet koeling.